Buttermilk pie is a Southern favorite. I often saw it on the dessert menus when I lived in Georgia. The taste of buttermilk pie reminds me of custard, which isn’t a surprise since it contains egg and vanilla. However, since most restaurant buttermilk pies aren’t gluten free, I would only indulge in a taste of my husband’s order. So, the first challenge was to create a gluten free buttermilk pie. Pretty easy to do by substituting an all purpose gluten free flour like Bob’s Red Mill Gluten-Free 1-to-1 Baking Flour. I love this product because it cooks up just like regular flour in my gluten free recipes. The second way I made this buttermilk pie gluten free is by using Mi-Del Gluten Free Pie Crusts – either ginger snap or graham cracker. 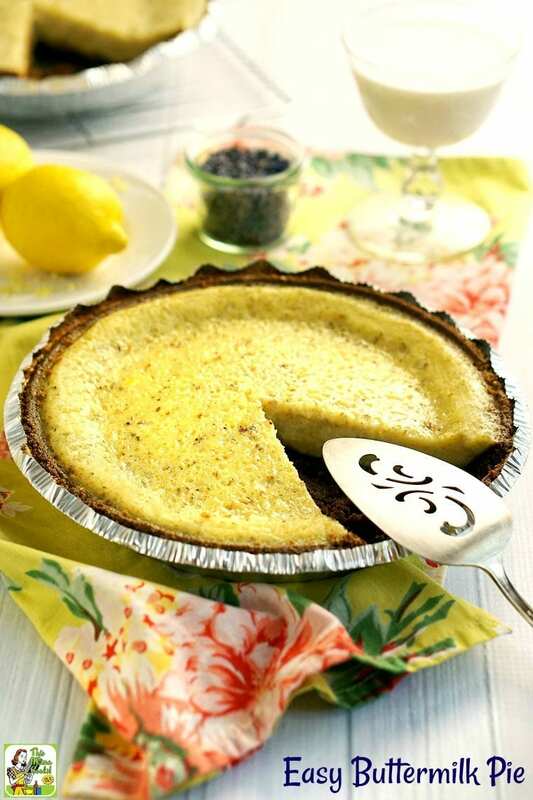 Using a ready made gluten free pie crusts makes this buttermilk pie recipe even easier! to find more of my favorite gluten free baking products! 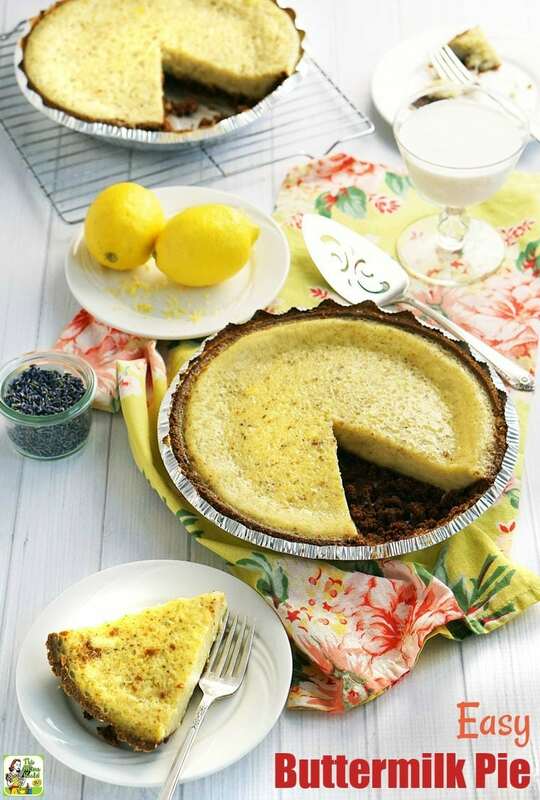 Why use lavender in a recipe for buttermilk pie? I love anything lavender, and keep a small jar of culinary lavender to use in cooking. Using it in a recipe for buttermilk pie seemed like a fun idea, especially when combined with lemon and vanilla flavors. If you can’t find culinary lavender at your local gourmet cooking shop, you can buy culinary lavender online. You can buy vanilla beans online if you can’t find them in a store near you. I used a mini food processor to chop up the lavender and mix it into the sugar. 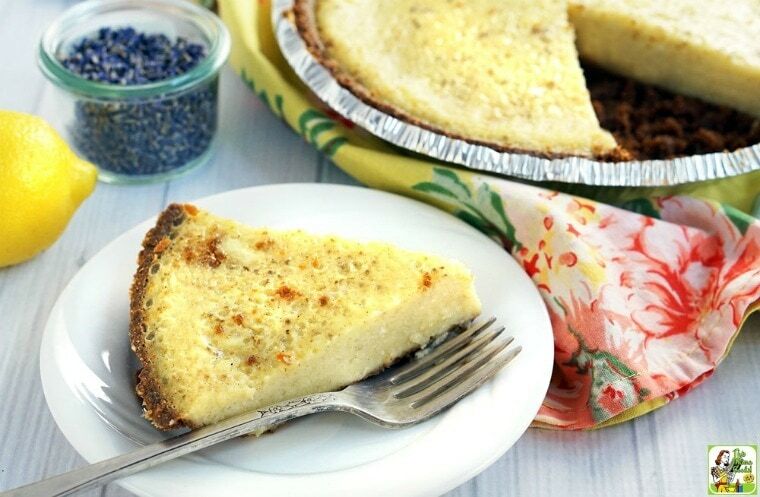 You don’t want to bite into a slice of Easy Buttermilk Pie and come away with a mouthful of lavender flower buds, so chop it up! I used full fat buttermilk in my buttermilk pie recipe. I don’t see why low fat buttermilk wouldn’t work just as well. Hate that your baking sheet warps and your pies spill over on one side? The Nordic Ware Natural Aluminum Commercial Baker's Half Sheet is made with commercial grade aluminum and won’t warp. If you have too much buttermilk pie batter than fits in the pie crust, pour any extra batter into an oven safe ramekin and bake until the center is firm. Don’t worry if your Easy Buttermilk Pie puffs up in the oven during baking. It’ll settle down after cooling though it may crack a little. No biggie if it does! Refrigerating the buttermilk pie for a hour or two makes it so much easier to cut, especially if you use a pie server instead of a regular knife. 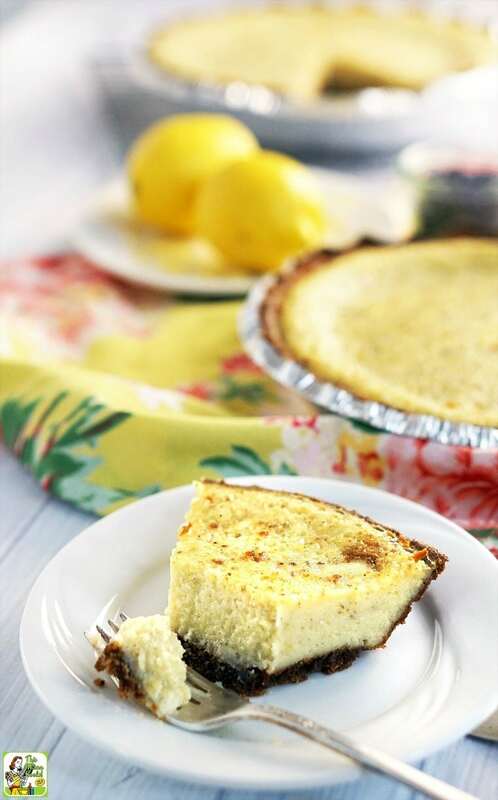 Refrigerating it means your buttermilk pie won’t fall apart when you move your slice from the pie to the plate, too! Place sugar, lemon zest, and lavender in a food processor. Scrape seeds from vanilla bean into food processor. Pulse until lavender is finely chopped. Add gluten free flour and salt to processor. Pulse until thoroughly mixed. Pour sugar mixture into a large bowl and set aside. Place beaten eggs, buttermilk, and then melted butter in a medium bowl. Gently beat with a wire whisk until thoroughly combined. Pour buttermilk mixture into sugar mixture and stir with wire whisk until completely combined. Place prepared pie crust on a baking sheet. Pour the buttermilk pie batter into the pie crust. Place pie in oven and bake for 10 minutes at 400 degrees F. Then reduce oven temperature to 350 degrees F. Bake buttermilk pie for 50 minutes or until the center is firm. Remove pie from oven and cool on countertop. Then refrigerate for 1-2 hours before serving. Published on August 3, 2016. Updated with new pictures and information. 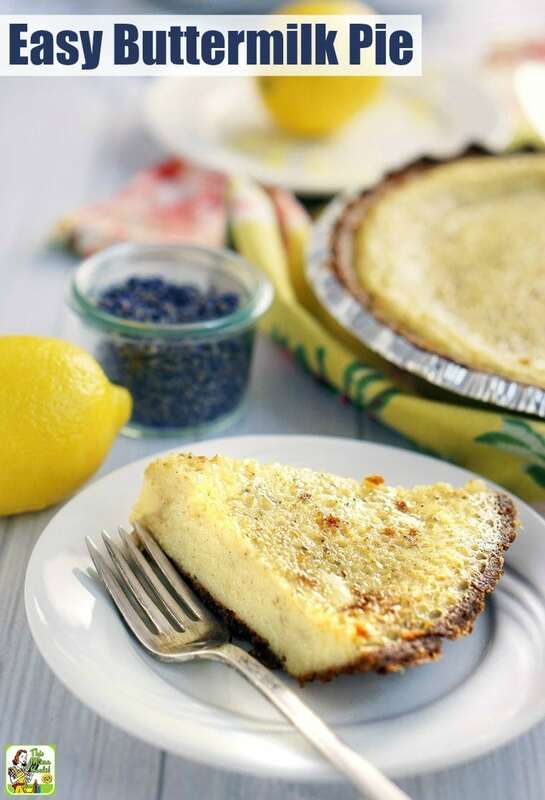 Posted in Desserts, Gluten Free, Recipes and tagged pie, Southern cooking on April 9, 2019 by Anne-Marie Nichols.